The Empire style, which survived about ten or fifteen years after the period of the First Empire, 1804-14, like the preceding Louis XVI style, has the antique as its avowed source of inspiration, but in this case it is the strict application to fhe principles by which the Louis XVI style purported to be governed. The style is simple, severe, not very intimate, cordial, nor comfortable. The figure of the wood must be superb because it is displayed in large masses with little decoration, while the bronzes, isolated as they generally are in the center of large panels of plain wood, and because they often are responsible for the entire decorative effect, assume great importance and must be excellent in composition, sculpturing, and chasing. It may be said that Percier and Fontaine are the creators of the official Empire style; they understood this epoch when national pride and war-like enthusiasm filled the air. The style of furniture which they conceived, with its broad austere surfaces defined by straight lines and sharp edges and on which they displayed golden Greek palm leaves and wreaths of laurel to crown the victor’s brow, or figures of victory with outspread wings and flowing robes, was admirably suited to Imperial France. Later, in 1814, when this period of exaltation had subsided and the Bourbons were restored to the throne, royalty stripped of its former splendor and the peaceful bourgeoisie mostly parvenus without taste, the style no longer befitted the times. It continued to exist in a desultory fashin, for lack of any compensating originality to replace it and became heavy and dull like the period itself. Most of the knowledge of antique furniture had to be acquired by studying classical prototypes represented on bas-reliefs, vase paintings, and mural decorations. Hence, Fontaine et Percier realized that it was almost impossible to remain completely faithful to antiquity, since it was necessary to create almost everything and adapt the remainder to modern needs. The Louis XVI style had already eliminated many curved elements, but the Empire style almost waged a war against them. Round supports are very often replaced by members rectangular in plan, such as pilasters and legs of square section. Columns may still be found on certain pieces, but they are generally detached so that the sharp corners are easily seen. The columns are smooth, cylindrical or slightly conical, with the capital and base covered in metal. The use of moldings, which gives interst to even the simplest furniture, was almost abandoned. The most distinguishing feature of the style is its clear-cut silhouette. The corners are sharp and exact, and any attempt to soften them is discarded. The manner in which the panels are framed was instrumental in achieving the much coveted block-like appearance. The use of heavy bases was introduced to accentuate further still the massive, monumental look. In no other style is symmetry so closely followed. 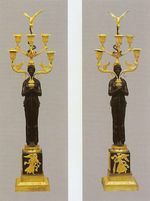 The French ébéniste recognized the necessity for decorating the large even surfaces of dark shining mahogany with gilt bronze mounts depicting a race of strange creatures. Everywhere are found winged sphinxes, winged lions and chimeras of every kind, often with heads of eagles, employed as table legs and chair armposts. Swans employed as armposts or as entire arms of chairs forming the legs with their bodies and the arms with their wings. The bronzes are often notable for the ingenious symmetry of their composition, the clarity of their lines, the effectiveness of their light silhouette against a dark ground, and above all for their chasing and gilding, which in the fine pieces, such as some of the bronzes by Thomire, are superb. Practically all the motifs that are found in these bronze mounts are borrowed from antique Greco-Roman or Egyptian art. There is a multitude of objects of every kind, gleaned from altars, tombs, Pompeian mural decoration, and even Roman goldsmith work. Such are antique heads, cornucopias, the winged thunderbolt of Jupiter, Neptune’s trident, Mercury’s caduceus, Bacchus’ thyrsus, casques, lamps, tripods, kraters, amphorae, winged torches, and musical instruments. Then there are emblems of victory, war-like emblems and Imperial emblems, motifs from the animal world and floral motifs, of which poppies are much favored. Since many new combinations of lines for chairs were attempted, the variety of Empire chairs is much greater than might be expected. As a rule, the forms are stiffer and heavier than those of the Louis XVI period. The lines are broad and simple but by no means always straight, as may be seen in rolled-over chair backs whose profile resembles the line of an elongated S; in gondola-shaped chair backs hollowed to a half cylinder and joined to the front legs by a concave curve; in arms without armposts that terminate in a large open volute resting directly on the tops of the legs, and in concave rears legs, square and tapering, which are typical of the style. Then of course there are chairs and stools of ancient curule form with gracefully curving X-form supports. By far the majority of chairs are made of mahogany. Ambitious examples may be mounted in bronze; in other chairs the carved enrichments in emulation of the bronze mounts may be gilded. Under the Empire, beds are given an entirely new shape derived from the antique; properly they are seen from the side and frequently placed in a richly draped alcove. They are called lit en bateau, or boat beds. The head and foot, which are of equal height, with a small roll or volute at the top, widen toward the lower part. Small dome-shaped canopies extending from the wall are typical for this general class of beds. As for tables, from massive dining tables to small guéridon tables, the great majority are round, no doubt because almost all of the Greek and Roman tables were round. Table tops, as often as it is possible, are of geavy marble. When the legs are not in the form of columns with a capital and base of bronze, a most incredible assortment of strange figures may be seen supporting the tops. Console tables are nearly always rectangular, the back between the rear legs frequently fitted with a mirror. The Empire toilet table has a rectangular top, in most instances of marble, a frieze drawer containing the necessary toilet equipage, and usually lyre-form or curving X-shaped supports. Secured to the top are two slender uprights provided with candle arms, to which is attached by swivel screws a framed mirror. Accompanying the toilet table is a lavabo, a small circular basin stand copied from an antique tripod. Secrétaires with drop fronts, bureaux with cylinder tops, bonheur du jour, commodes, low cupboards and bibliothèques remain in high fashion. Important to an Empire drawing-room are two musical instruments, the harp, so typically Empire, and the pianoforte, a rare and costly novelty with its pedals often of lyre form. The Empire style, which embraced practically all of Europe, is the last great classical style – known as the great period of the Jacob family ébénistes – and marks the end of the golden age of French cabinetwork. Apart from the abolition of the guilds, the introduction around 1814 of the factory system, even in a very simple form, further depressed the standards of craftsmanship. As the nineteenth century progressed, industrialism with its mass-production methods opened the gates to the great rush of imitative styles that eventually overwhelmed the art of cabinetmaking.